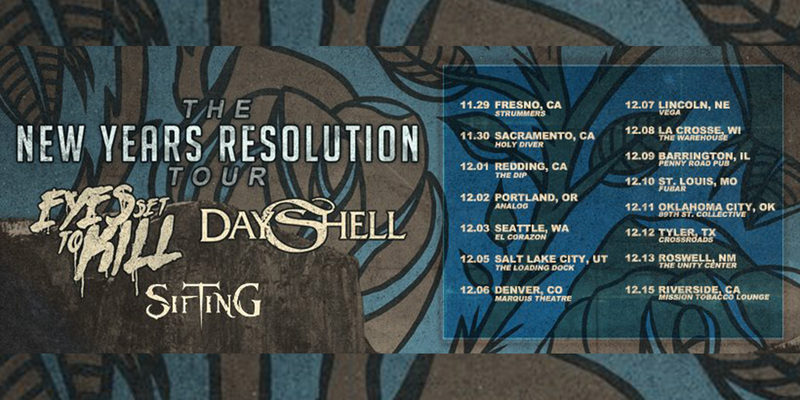 Hot off their return from Ecuador as direct support for Tarja, Los Angeles, CA’s modern prog rock/metal outfit Sifting have been added to The New Years Resolution Tour, supporting Dayshell and Eyes Set to Kill. The fifteen-date tour begins on November 29 at Strummers in Fresno, CA, and wraps up December 15 at Mission Tobacco Lounge in Riverside, CA. Get more information and purchase tickets here. Sifting are currently supporting their new album Not From Here which was produced by Ryan Williams (Velvet Revolver, Rage Against the Machine) and Steve Evetts (Sense’s Fail, The Dillinger Escape Plan, Suicide Silence). They have also released three music videos for the songs ‘Blowing Fire’, ‘Nothing But Us’, and the title track, ‘Not From Here’. Buy the full album on CD, iTunes, Amazon, or Google Play, and stream the full album via Spotify, Apple Music, Pandora, iHeartRadio, Deezer, and more!